This web page describes the methodology and data sources used to measure the behavior of the people of the United States in following the First Commandment. Current Value: +11.08214 lives per thousand people. This index was last updated on March 14, 2004. 2 I am the Lord your God, who brought you out of Egypt, out of the land of slavery. It's not clear whether verse 2 is a preamble to the First Commandment, or a preamble to the entire Decalogue. (Ancient Hebrew manuscripts contain verse divisions, and verse numbers were added for the Geneva Bible in 1560.) In any case, it works for the Morality Index as a nice positive statement: You shall acknowledge Me as your God. The negative component is acknowledging and worshipping other gods besides Yahweh. The neutral zone would be not acknowledging any gods at all. But there has been a lot of history since Moses, and the various western monotheistic faiths have diverged since that point. What about Jesus, Mohammed, Joseph Smith, and so on? The Morality Index prefers to take the original meaning of a commandment if that meaning is still relevant today. Therefore, we want to know if someone believes in the God of Moses. If the person answers "No", we thank her for her time, and write down a score of zero on our clipboard. We're done here. On to the next house. 2. Which god? The God Who gave Moses the Ten Commandments on Mt. Sinai? It's okay to remind the person that it was Moses and not Noah. The person answers "Yes" or "No" to the second question. We write down a score of +1 for "Yes", and -1 for "No". Then we thank the person for her time, and walk on to the next house. For this commandment the simple expression of belief is sufficient. We don't argue with the person: "You say you believe in God; but you're not part of any faith community, you don't even own a Bible, and you've been cheating on your income tax for the past five years." We simply take their word that they believe in God. There are other commandments to cover how they behave in response to that belief. Now, since Gallup and the other polling organizations don't ask questions exactly the way I want them to, we must infer our information from the questions they do ask. Fortunately, the mainstream theology of the various faiths is fairly clear with regard to Moses. Jews and Christians revere Moses, and explicitly endorse the Ten Commandments. Muslims also believe in the God of Moses (see the section on Islam below). So the three Western monotheistic faiths are scored on the positive side of the Morality Index. The Jews say: "Ezra is the son of God;"
the Christians say: "Christ is the son of God." following assertions made by unbelievers before them. May they be damned by God: How perverse are they! - The Koran, Book 9 (Repentance), verse 30. For my part, I reject the revelation of Muhammed (I'll refrain from cursing Muslims or calling them "perverse"). Jews, Christians, and Muslims reject the revelation of Joseph Smith (prophet of the Church of Jesus Christ of Latter-Day Saints, also known as the Mormons). I choose not to be offended if people do not accept the revelation of Jesus Christ; I understand that it's my job to tell them. But Jews, Christians, Muslims, and Mormons do agree on the God of Moses, and that is the standard upon which this index is measured. I am not happy with this data set. There are gaps in the years, the record does not extend back far enough or up to the present, and we have missing data (N/A). We must interpolate or extrapolate to estimate the missing years. I am sure that the Princeton Center did an excellent job with the data they were able to gather, but I would still like to see a more complete and longer record. But the biggest problem for the Morality Index is that Islam is not broken out into a separate category. To address this problem, I will arbitrarily divide the "Other" column in half, and assume that half are Muslims and the other half are some non-God-of-Moses faith. This ruling has the unfortunate effect of relegating an important world religion (Islam) into merely "half of Other." It also ignores the Eastern Orthodox Church. Although the numbers here are statistically small in the United States, it's still a big theological problem. I apologize to Muslims who may be offended by this calculation. I will try to locate more complete data. I performed a linear interpolation across the missing years. The processed data is shown in the table below. "Non-God of Moses" refers to Buddha, Vishnu, Gaia, etc. The Christian totals were higher than I expected. The data says that in 1998 the American population was 86% Christian (Protestant 59% + Catholic 27%)? Is that right? However, note that the original data is entitled "Religious Preference". This category probably counts people who are "Catholic by tradition", "raised Methodist", or "my family is Jewish". Probably the number of people who have life-transforming faith is lower, but until I can find out exactly how much lower I'll have to use these numbers. For years before 1980 I simply used the 1980 value. For years after 1999 I simply copied the 1999 values onward. These extrapolations have the effect of signifying "No Change" for outlying years in which we have no data to report. This section works through all the adjustments and calculations made, from the original datum through the final index value, so interested readers may follow and verify the methodology used. We will use the year 1998 because it's an interesting little peak on the graph. In 1998 90.5% of the United States population expressed a "religious preference" for the God of Moses. This percentage converts to a morality score of +905 per thousand people for one year. However, that preference was expressed for one year only, not for these people's entire lifetime. "Perfect morality" for this commandment would be to believe in God for one's entire lifetime, and to answer "Yes" every time the pollster comes by. To convert from a single yearly measurement to the equivalent lives we must divide by the life expectancy. 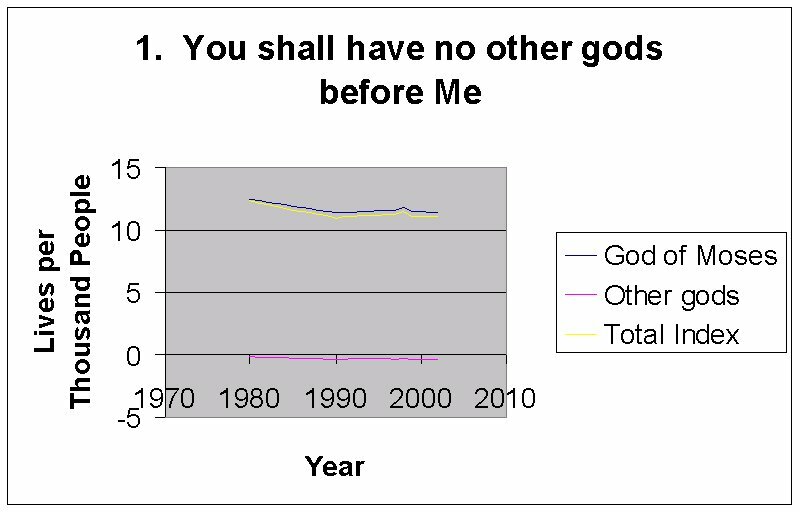 In 1998 2.5% of the United States population expressed their "preference" for gods other than the God of Moses. Again, we must adjust by the life expectancy. In 1998 7% of the American population expressed "no religious preference." Lacking further information, we assume that these people are atheists. As noted earlier, atheism is scored as neutral for this commandment. The table below contains the final index values for the First Commandment. Note the constant extrapolations outside the years for which we have data. Remember that the Morality Index is useful for its ability to highlight trends, not for its absolute value. Constant values are strictly neutral with respect to spotting trends. Extending the values here allows us to combine this limited data set with the other (more complete) commandments. Morality Index Values for Commandment 1. That's also known as the first article in the Bill of Rights. Obviously we are interested here in the first clause: Congress shall make no law respecting an establishment of religion, or prohibiting the free exercise thereof;. Make no mistake: The First Commandment was given specifically to respect an establishment of one particular religion, and to prohibit the free exercise of all others. That was God's intent when He gave the First Commandment. It's clear from the text of the First Amendment that the First Commandment cannot become the law of the United States. And I think that's a good thing! Christianity should never be coercive; people must come to believe in God of their own accord, probably after reading the Bible and hearing witness from believers. By my reading of the Bible forced (and probably fake) conversions "don't count" on Judgment Day. I believe that the plain meaning of the First Amendment is in accord with the message of the entire Bible, and is appropriate for the United States from 1776 onward. However, the First Amendment also guarantees the free exercise of religion, meaning that everyone can freely believe or not believe as they wish, and express that faith openly. During the latter half of the 1900s the U.S. Courts attempted to solve this dilemma by prohibiting expressions of religion in state-sponsored venues. In other words, the government shall not sponsor or appear to advocate any particular religion at all. Unfortunately, government is made up of people of various faiths and non-faiths, and the Court's decisions have the effect of driving expressions of faith out of public life. I think that's wrong. Plan A. Everybody gets to have their say. Plan B. Nobody gets to have their say. Plan A would allow for expressions of religion in public and government-sponsored venues, and every faith or non-faith gets a chance for expression. Where there are limited resources (monument space, air time, acres of park land), then the resources shall be pro-rated among the various faiths according to their number in the general population in that geographic area. For example, if Christians represent 60% of the population in one city, atheists represent 30%, and Buddhists represent 10%, then the holiday display area shall be apportioned according to those percentages. The final details can be worked out at the local level. Although Christianity is the dominant religion in the United States, in local areas that may not be the case. For example, the state of Utah is dominated by the Church of Jesus Christ of Latter-Day Saints (the Mormons). The LDS considers itself to be a Christian church, but most other Christian denominations do not agree. In Utah we can expect the public displays to be influenced by the LDS Church. Everybody who advocates Plan A had better be okay with that! So in the Utah State Capitol you should expect to see a huge statue of Joseph Smith, flanked by much smaller statues of Martin Luther, John Calvin, and the Virgin Mary. Anyone who doesn't like this arrangement should refer to Plan B. Plan B forbids all expression of faith under government sponsorship, and this is the plan that the Courts are moving us toward. Plan B embodies the "separation of church and state", where the state simply does not mention any religion at all. At least it's a simple solution. In engineering we often speak of "Plan A and Plan B" solutions to a problem. Plan A is elegant and sophisticated. Plan B is clumsy and awkward, but reliable. Everybody prefers Plan A if we can get it to work. If not, we'll fall back on Plan B, but that is everybody's second choice. I fully intend to convey that engineering usage with regard to Plan A and Plan B for implementing the First Amendment. In July 2001 Alabama Chief Justice Roy Moore commissioned a large granite monument of the Ten Commandments, and placed it in the rotunda of the State Judicial Building in Montgomery. This display created some controversy, and in 2002 a Federal court ordered Moore to remove the monument. He refused to do this. After a series of legal wrangles, the court removed the 2.6-ton monument from public view in November 2003. Chief Justice Roy Moore was suspended on ethics charges for defying the Federal court order and was removed from office. I am not a supporter of Roy Moore, because he concentrates so completely on the "free exercise" clause of the First Amendment while steadfastly ignoring the "respecting an establishment" portion. Nevertheless, this is a useful case study. As you can see, the Federal court implemented Plan B, and the rotunda of the Alabama state judicial building remains devoid of any religious display. Under my Plan A, the Ten Commandments monument would stand, and beside it atheists would be permitted to display a much smaller monument to the Law of Consequences, sized according to their representation in the general population. Muslims would place a figurine of the Five Pillars of Islam if they chose to do so. For whoever does not like the idea of mixing religious displays in the same forum . . . there's always Plan B! For whoever thinks it's too much trouble to re-size the monuments whenever the relative populations shift significantly - there's always Plan B! This is a clear statement of monotheism, but is that one god the God of Moses? To find out, I bought an English translation of the Koran and read portions of it (Al-Qur'an, A Contemporary Translation, by Ahmed Ali, 1993). I was looking to see what the Quran had to say about Moses, and especially if I could find the Ten Commandments (the Decalogue) in the Koran. I was assisted in this task by Dr. Frederick Denny, professor of Religious Studies at the University of Colorado at Boulder. I took a sola scriptura view; that is, statements about Moses and the Ten Commandments had to be present in the Qur'an itself, not part of later Islamic tradition. both an apostle and a prophet. The Koran surely does this. set by the Lord was completed in forty nights. "Deputise for me among my people. of the authors of evil." that I may behold You." you may then behold Me." to You in repentance, and I am the first to believe." so receive what I give you, and be grateful." and command your people to observe the best in them. I will show you the abode of the wicked. There we see a clear reference to the Law, inscribed on the tablets by God and given to Moses to take down from Mt. Sinai to the Israelites. Unfortunately, the Koran does not say exactly what was written on those tablets. I am left with the impression that I should go look in Exodus if I want to find the exact content of the tablets. I did not find a clear statement of the Ten Commandments in the Koran. This was disappointing. Since the Decalogue is the most important part of the Law given on Mt. Sinai, it's puzzling that the Koran does not include it per se. Dr. Frederick Denny gave me an article addressing this question, from Encyclopedia of the Qur'an, Volume One A-D, by Jane Dammen McAuliffe, General Editor, 2001. The article "Commandments" states, "The Qur'an does not refer explicitly to the biblical Ten Commandments or 'ten words', and Muslim exegetes have not generally tried to find either the Decalogue itself or a Muslim equivalent in the text. The Qur'an does speak of tablets given to Moses but alludes to their content only in general terms:". The Koran mentions "nine clear signs" given by Moses to Pharaoh in Q 17 (The Children of Israel):101 and Q 27 (An-Naml):12. Some Muslim commentators have taken these signs to be a version of the Biblical Ten Commandments, but I don't believe it - the context of the verses clearly indicates that the signs were miracles performed by Moses to convince Pharaoh to let the Israelites go. The Koran has two lists of commandments in Q 17:22-39 and Q 6 (The Cattle):151-153. I found that I could pick out about half of the Commandments in these passages, but I would not have recognized these verses as The Ten. The McAuliffe article states that "Muslim commentators have not generally connected the list [from Sura 6] with the Ten Commandments", although some individuals have made that case. and we believe what has been sent down to you. and to Him we submit." This is a clear statement from Islam that Muslims believe in the God who gave Moses the Ten Commandments. They clearly assert that they are following the First Commandment. Obviously there are other revelations that separate the three great Western monotheistic faiths, but they do agree on the God of Moses. In conclusion, I rule that Muslims are indeed following the First Commandment. They clearly revere Moses and the God who appeared to Moses on Mt. Sinai. Although the Ten Commandments are not in the Koran as such, the Koran appears to refer to the Book of Exodus as a valid source of further information. Finally, the Koran states that "Our God and your God is one." It is on these bases that Muslims are counted on the positive side of the Morality Index for the First Commandment. I imagine that many people will be offended by portions of the Morality Index. Here is my chance to be offended. The ruling above indicates that the Dalai Lama of Tibet scores a -1 on this portion of the Morality Index, while Osama bin Laden of al-Qaeda scores a +1. The Dalai Lama is a kind and decent man who preaches love and non-violence. Osama bin Laden preaches hate, violence, and slaughter of civilians. How can it be that the Dalai Lama scores lower than bin Laden? Dalai Lama morality score = -1. Osama bin Laden score = +1 - 3,047 = -3,046. That tally should set the record straight! Furthermore, it's probable that the Dalai Lama's message of peaceful methods has saved many lives. I'll happily credit him with those lives if someone knows how to count them. This page accessed times since February 5, 2004.